It goes to show how much the Chef’s Choice brand dominates the knife sharpening market, that this offering from Smith’s is one of the very few in our top 10 list not to be designed by the more ubiquitous label. That being said, the Adjustable Edge Pro has many features, deserving of its place in our table. 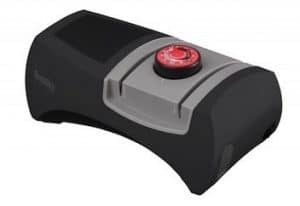 The new sharpener incorporates Smith’s interlocking wheel technology using both diamond and ceramic abrasive materials. 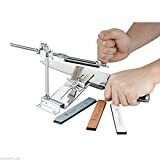 This feature seriously increases the versatility of the machine, enabling the user to sharpen everything from thin kitchen knives to thicker hunting knives at the same angle as the original factory edge. By adjusting the angle of the slot, (using an oversized adjustment dial), you merely have to set the correct angle and pull the blade through the slot in order to sharpen. Although some guidance is given on the dial as to the angles for sport or kitchen knives, it can be a little daunting if you are not completely aware of which angle to use. This might be off putting for some. 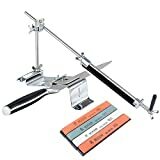 On the plus side, the interlocking wheels really do deliver fast and precise sharpening, as the blade is held so securely on both sides through out the process. Smith’s also claim that the design of the Adjustable Edge Pro eliminates the possibility of marring or damage to the blade, this reduces the time it takes to sharpen, and through the use of superior materials the results leave no burring on the cutting edge. What we can tell you is that the Edge Pro can easily sharpen knives made of alloy, carbon, or stainless steel. Furthermore, outdoor sports knives; tactical knives and even custom knives are included in its repertoire of sharpening expertise. 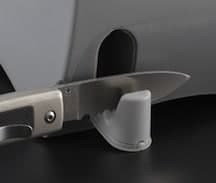 Smith’s warn that the electric interlocking wheels are not designed for knives with a bevel on just one side of the blade, serrated blades, or blades made of ceramic material. 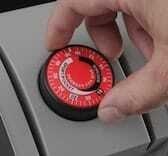 For this you will need to use the manual sharpening slot on the side of the unit. However, the Edge Pro’s design quality extends to this as well. The manual sharpening slot features specially-shaped, crossed ceramic stones. These have been designed specifically to follow the contour of large or small serrations. When not in use, the serrated blade sharpener neatly folds into the housing of the unit. To ensure secure and stable sharpening on all flat surfaces, the unit comes with non-slip rubber feet. It also has a soft grip on the top of the unit for comfort while in use.